Only one book in my mailbox this week, but it's a book I've been waiting on FOREVER! I am so excited to get started on Cinder. It sounds really, really awesome! This is super cool! Did you get it from NetGalley? Just curious because my request from months ago (well it seems like it was that long ago lol) just got approved today! :-) I'll be curious to compare notes. I want to read Cinder too! I think it sounds like a very creative concept. 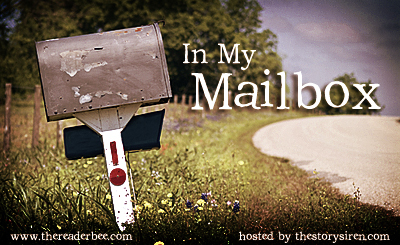 I hope you enjoy it and I look forward to hearing what you thought of it. This one looks really good! I'm looking forward to your review. Ooh nice! Hope you enjoy it! I just got this today :D so excited to read this! cinder looks great, having heard much of though. I just realised I got Cinder when I posted my IMM, can't wait to read it, looks fantastic! Ah, Cinder! <3 Really hope everyone enjoys this book! I snagged this one as well. I am kind of excited about a cyborg Cinderella! Looking forward to seeing if you like it or not. I just love the cover and would probably buy it for that alone! Although the cover is nice and eye-catching, I don't think I'd actually like Cinder. I hope you enjoy it though! Seems like everyone got Cinder this week! I hadn't even heard of it before. a cyborg Cinderella? Sounds totally cool! A lot of people have gotten this this week. It sounds very original! Hope you like it! I think Cinder sounds so unique! I can't wait to read it. So need to read Cinder! Enjoy your reading this week! SO JEALOUS! I can't wait to read it!! So excited to read Cinder! I can't recall reading a single book that features cyborgs, so I can't wait to see what this book has in store! Looking forward to comparing notes with you Christy! SO exciting!! The cover alone got me intrigued but I totally want to read this one too! I hope you love CINDER as much as I did! Ah. A book that most everyone who joins IMM seems to be talking about. Like everyone else, I'm curious about your take on the book. One book is fine. I think that should set a precedent, really, I'm beginning to think I'm a serial book buyer!!! Haha. I am curious about this book. Waiting to see what others think of it before diving in. I am glad you have a copy, as I love your reviews. I saw Ciinder on netgalley, but I didn't think I would like it. It keeps popping up on people's blogs. I'll be looking out for your review! Thanks for stopping by my IMM. I hope that you enjoy Cinder! I'm really looking forward to reading this book! Hope you enjoy!! Can't start to start reading Cinder. Hope we both like it. Happy reading. Oh, I'm extremely excited about Cinder! It's been on my wishlist for-evah. Happy reading! Ooh! You got Cinder!? I am very curious about that one. I can't wait to read it. You'll have to let me know what you think. :-) Happy Halloween, Christy! I love the cover to this one. Hope you enjoy it. I've never heard of this one before. I'm intrigued to know why we can see her bones through her skin. Cinder sounds great! I hope you enjoy it. 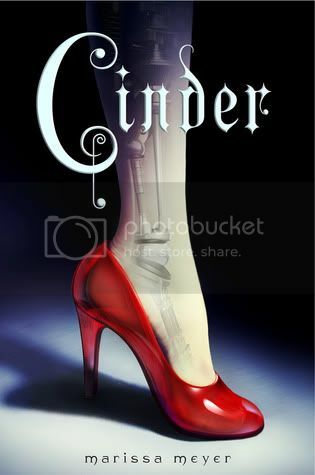 I love the cover of Cinder, can't wait to read your review. Pls come chk out my IMM this week. I just got approved for Cinder as well but have not downloaded it yet. Soooo excited to read this book, have heard fantastic things about it! Cinder looks positively awesome! Hope you enjoy! woohoo! I just started reading it this morning - and I am definitely like it thus far!